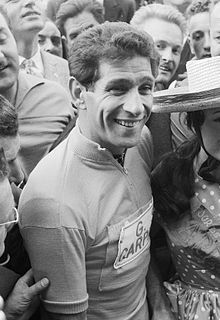 Gastone Nencini (Italian pronunciation: [ɡaˈstoːne nenˈtʃiːni]; 1 March 1930 – 1 February 1980) was an Italian road racing cyclist who won the 1960 Tour de France and the 1957 Giro d'Italia. Nicknamed Il Leone del Mugello, "The Lion of Mugello" (from his birthplace Barberino di Mugello, near Florence), Nencini was a powerful all-rounder, particularly strong in the mountains. He was an amateur painter and a chain smoker. He was a gifted descender. "The only reason to follow Nencini downhill would be if you had a death wish", said the French rider Raphaël Géminiani. It was in trying to follow Nencini down a mountain on Stage 14 of the 1960 Tour de France that Roger Rivière missed a bend, crashed over a wall and broke his spine. 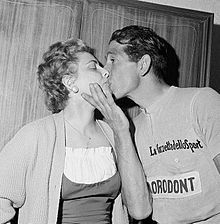 I couldn't tolerate the idea that Nencini was the best descender of the peloton. I said to him, call the blackboard man, we'll do the descent together and whoever comes second pays for the aperitifs this evening. So he called the ardoisier and asked him to follow us. The road was of compressed earth. We attacked the drop flat out. I let Nencini take the lead so that I could see how he negotiated the bends before attacking him. In the end I dropped as though I was alone. At the bottom, I had taken 32 seconds out of him, written on the blackboard. I was really tickled. I had beaten Nencini. The next time I saw him was that evening in the hotel I was staying at. He had just bought me an apéritif! At the Futa pass, on the mountains over his native Barberino di Mugello, a monument is placed remembering him: a big bronze bas-relief portrait of him racing and the inscription which says: "A Gastone Nencini. Il comune di Barberino, gli sportivi, i compagni di tante battaglie ricordano il campione mugellano" (translated from Italian: "To Gastone Nencini. The administration of Barberino, the sportsmen, the comrades of many battles remember the Mugello-born champion"). Wikimedia Commons has media related to Gastone Nencini. ^ Vergne, Laurent (22 July 2015). "Cannibale, Chéri-pipi, Wookie, Andy torticolis… le Top 20 des surnoms mythiques du cyclisme" [Cannibal, Chéri-pipi, Wookie, Andy Torticollis... the Top 20 mythical nicknames of cycling]. Eurosport (in French). Retrieved 11 April 2016. ^ Brisson, Jean-Pascal (2014). Les 100 plus grands cyclistes de l'histoire. Paris: Editions Clément. p. 77. ISBN 979-1092547-65-8. ^ McGann, Bill; McGann, Carol (2006). The Story of the Tour de France: How a Newspaper Promotion Became the Greatest Sporting Event in the World. Vol. 1: 1903-1964. Indianapolis: Dog Ear Publishing. p. 243. ISBN 1-59858-180-5. ^ McGann, Bill; McGann, Carol (2006). The Story of the Tour de France: How a Newspaper Promotion Became the Greatest Sporting Event in the World. Vol 1: 1903-1964. Indianapolis: Dog Ear Publishing. p. 244. ISBN 1-59858-180-5. This page was last edited on 19 January 2019, at 21:27 (UTC).